Commercial Kitchen Equipment and Supply Blog - Ckitchen.com - Catering: Is It Right For Your Restaurant? Catering: Is It Right For Your Restaurant? You have a successful restaurant with a track record of providing quality meals, diverse menus, and exceptional customer service. You have a good grasp on what it takes to stay ‘trendy’ and continually satisfy your patrons, giving you not only a loyal customer base but also a growing crowd of interested consumers. As they say, your ‘business is booming’! While you enjoy the plateau of ongoing success, you’re looking for yet another way to increase revenue for your restaurant - another outlet for your sales to grow even beyond the parameters of your brick and mortar business. Looking to expand, you may consider the far-reaching prospect of catering! While catering can be a great way to generate new revenue and clientele, how do you know if your restaurant is ready for the leap? Should you offer catering? -Large Food Prep Area: Because catering involves larger quantities of items in larger batches, your restaurant should be fully prepared with the appropriate work-space. Large work centers are ideal for this situation, and should be situated in an area with easy access to both storage and an exit (for quick transfer of items to a storage van for off-premise catering). Don’t forget the basics, such as a convection oven, tilting skillet, and a 10-burner range if your restaurant doesn’t already use this equipment. When weighing these investments, consider what can be purchased outright as opposed to leased! -Appropriate Storage: Many items in a catered meal are prepared ahead of time and stored until assembly. Both heated cabinets and walk-in units are ideal! Similarly, storage for transportation and off-site are required. Food carriers are wonderful additions to your catering stock, and a necessary addition for temperature-regulation and insurance purposes. 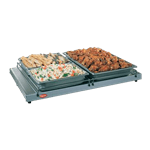 -Presentation: Portable buffet warmers and shelves help for serving buffet-style catering events, as they’re a professional option for presentation. Similarly, drink dispensers are used for self-serve purposes, ideal for large semi-formal or casual catering parties. -Cutlery: Your restaurant may choose to offer tableware for catered events - some of which can be disposable! For the more formal catered event, consider investing in an additional collection of plates, glassware and cutlery to match the formality. Storage/dishwasher racks will help you to store, transport and then wash these items. In addition to these points, your restaurant should consider creating a separate menu with ‘bulk’ costs, accessory fees, insurance, and a separate vehicle for transportation to off-site catering events. While the investment may seem large, you can off-set the costs with leasing your items (check out our blog on Instant Lease Prices!). With proper planning and appropriate execution, catering can generate a substantial amount of revenue and loyal following of patrons for your restaurant!